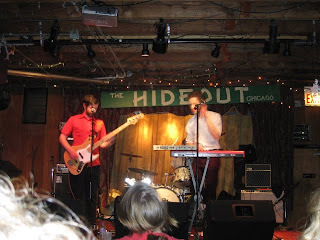 Chicago’s Baby Teeth took the stage at Hideout Thursday night, playing to a crowd of over 50 fans and testing new tracks for an upcoming album. The set oozed with the contagious pop melodies of the album Hustle Beach, with tracks such as “It’s Hard to Find a Friend” and “Let it Roll.” Each member of the band belted in harmonic symphony into their microphones, bringing to the stage a strength in vocals that is much more apparent live than on their recordings. The atmosphere was lively and in tune with the band as fans danced, cheered and tightened closer to the stage as the heartfelt track “It’s Hard to Find a Friend” began. The chances they took included replacing setlist spots normally reserved for sing-along tunes such as “The Simp” with newer songs slated for the upcoming release. The crowd danced along to new tracks “Banter 2.0” and “Space,” the latter described by Levitan as a song about severe depression. The band ended their set with the energetic title track from Hustle Beach, leaving the stage to hang with friends, fans and locals. Baby Teeth are a band to watch, as they continue to mature their pop rhythms away from their seventies comparisons and into their own unique style.